Tapping the Potential (February 2018) forms part of the Richmond Group’s Doing the Right Thing programme – an approach to building meaningful collaboration between the voluntary sector and public bodies. It describes their work in Somerset to date. 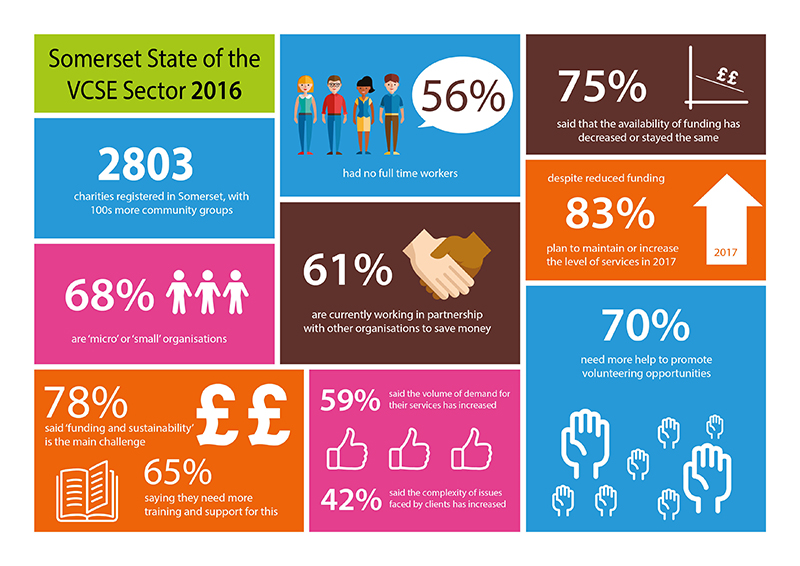 The State of the Sector Survey (February 2017) is the first in-depth review of the state of the VCSE sector in Somerset. This report is the first in-depth review of the state of the VCSE sector. It celebrates the great work being undertaken by so many organisations from large to ‘micro’ across the County, but also to explores the key issues facing these organisations. You can download an accessible version here. Vital Signs is a unique guide to local philanthropy, produced by Community Foundations up and down the country. The reports pull together existing research and a community consultation to gain a full picture of the issues in each area. Setting an analysis of need alongside inspirational accounts of how charitable giving is making a difference in our community, Somerset’s Somerset’s Vital Signs (2016) is a guide to inform current and future local giving in Somerset. Somerset Intelligence website provides data, information, intelligence and insight on Somerset and its varied communities which you may find of interest when compiling evidence for bids.